On September 23, 2018, the Maldives’ Joint Opposition Coalition candidate Ibrahim Mohamed Solih emerged victorious in the presidential elections. The win came as a surprise both to the opposition in Maldives and to international observers, as the election was believed to be rigged. Many international observers and media representatives were denied access to the island nation to monitor the presidential elections. The belief was almost confirmed when the opposition leaders faced a crackdown on the eve of elections by the government. In the third multi-party presidential election, democratic values, institutions and the survival of both were at stake. The Election Commission of Maldives (ECM) released provisional results on Monday, September 24 showing Solih, with 58.3 percent of the votes, as the winning candidate. The results were confirmed when the ECM congratulated Solih on its Twitter handle. Incumbent President Abdulla Yameen conceded defeat in a press conference where he said, “I know I have to step down now.” With a massive voter turnout of 89.2 percent, the voice of the people was truly heard. New President-elect Solih is viewed as a clean and efficient lawmaker in the Maldives, where corruption and nepotism remain prominent issues. Elected for the first time in 1994 after defeating a ruling party candidate when there was no opposition party, Solih became one of the founding members of Mohamed Nasheed’s Maldivian Democratic Party (MDP). He became the obvious candidate for the unified opposition when most of the leaders of the four opposition parties where either jailed or exiled. 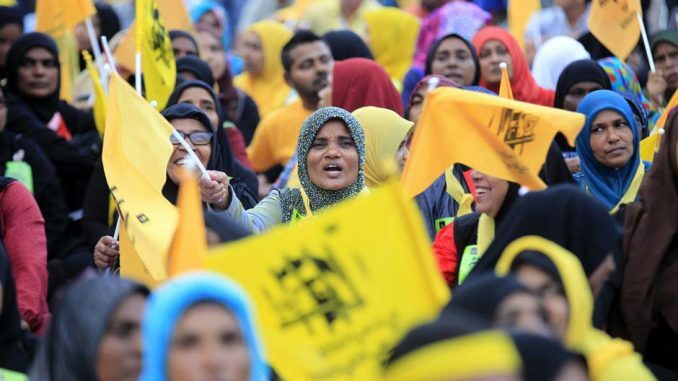 The dwindling state of the economy and popular protests had brought Yameen to power as the Maldives’ president in 2013 after Nasheed resigned. Then the fragile democracy in the Indian Ocean commenced its journey toward a controlled regime. Jailing rivals and judges, cracking down on dissent, suppression of freedom of speech and expression, and stringent media control, were increasingly visible facets of Yameen’s presidential tenure. Moreover, the country seemed to be drifting out of the political orbit of the United States, the United Kingdom and India, and toward China. In August 2014, during Yameen’s visit to China to attend the 2nd Youth Olympics, the Maldives expressed its wish to positively respond to China’s initiative to build what was then called the 21st Century Maritime Silk Road. This strengthened the already existing bonhomie between Yameen’s administration and China. The China-Maldives Friendship Bridge was opened to traffic on August 30, 2018. The bridge — officially called the Sinamale Bridge — links the capital city of Male to the Maldives’ Velana International Airport in Hulhule. The idea of connecting the two islands was initially mooted by an Indian company, but due to an unprecedented diplomatic row between India and Maldives, the contract was awarded to a Chinese firm. China was further successful in making inroads into the Maldives by winning contracts for upgrading and expanding Velena International Airport and the Hulhumale Phase II housing project among others. The signing of the China-Maldives Free Trade Agreement intensified the Chinese economic footprint in the tropical island nation. The victory of the opposition coalition calls for a reassessment of Chinese investments in the Maldives. China fears losing the existing diplomatic and economic clout which it currently enjoys in the Maldives. But can India regain its lost influence in the Maldives? Solih campaigned in the election on the promises of reviving the economy, putting a check on rising extremism, reviving democratic institutions and rebuilding ties with the Maldives’ neighbors, especially India. International media simplified the election battle into a choice between “pro-China” Yameen and “pro-India” Solih. Some analysts are of the opinion that with the victory of the “pro-India” candidate, India is assured greater engagement with its Indian Ocean neighbor and convergence of interests in the region, which indirectly means a lessening of China’s influence. But the establishment in New Delhi should not forget that it is not so easy to push aside China’s hard economic power and its “debt-trap” diplomacy. The case of Sri Lanka is a classic example. Even though the current establishment tried to reassess the nature of Chinese investments and reframe what it called “unjust” conditions when it came to power, Sri Lanka has to live with the reality of Chinese debt and its presence in the strategically located Hambantota port. The case of Pakistan is somewhat similar, where Islamabad has decided to go ahead with the China-Pakistan Economic Corridor (CPEC) without any reassessment by the new administration. China’s ubiquitous presence in the Maldives cannot be erased easily due to economic entanglements. Moreover, the United States and the United Kingdom enjoyed more diplomatic dividend than India even when Nasheed was in power. Moreover, strengthening democratic institutions, infrastructure support, and capacity building should remain India’s priorities in engagement with the Maldives. New Delhi has proved its commitments in the past with the establishment of a medical complex, the Indira Gandhi Memorial Hospital, in Male, as well as the Maldives’ first institute of Technical Education which was set up as a grant-in-aid project of India in 1996. Policymakers in New Delhi have a renewed chance for fruitful engagement with Male. This opportunity should not be lost in weighing third parties’ interests and involvement. India should act responsibly by allowing the internal equations in the Maldives to settle first and then engage constructively in the process of restoring democratic institutions. A stable Maldives is essential for a stable neighborhood across South Asia.